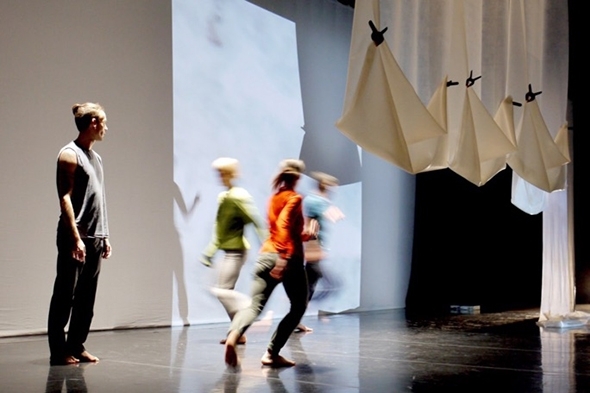 When the subject of a dance work in a theatre is something as disturbing and destabilizing as displacement, the context of the performance — from the lighting, the set and costumes, to the comfortable seats in a warm auditorium and the bar just outside the door — becomes a screen through which an audience experiences it. When this filter is accompanied by the choreographic device of gestural abstraction, the subject of the work finds itself even further removed from its source; a work on displacement itself becomes a displacement. This is the conundrum posed by Rahel Vonmoos’ to find a place, performed at the Laban Theatre on Tuesday and Wednesday night. Even if crisis is written into it in the form of the dis-ease of movement, the fragmented groupings, the dislocation of projected images and the collage of discordant sounds, the production values of to find a place are too refined and the choreography too beautifully performed by Helka Kaski, Luke Birch, Morrighan MacGillivray and Samuel Kennedy to allow an audience to get to grips with the emotional and psychological complexities of the humanitarian crisis it addresses. Vonmoos’ use of filmed projections on sheets of stretched silicon works well with the danced action; the opening visual sequence shows a crowd of people walking to and fro like a flock of humanity, slowed down in close-up to aimlessness and indecision; displacement, they seem to say, is a wandering with no direction home. The silhouettes of the dancers merge with the projected figures like blank, anonymous shapes against a mediatized throng. Apart from this extended opening scene, subsequent images are of landscapes and abstracted architecture, powerful reminders of events and places that have passed into memory, that float like fragments across the staggered placement of screens. There is a sense of time passing in the way the projected images spill from the screens on to the performers in the present or run in the background like the past. I begin looking for individual clues to what Vonmoos wants to convey, but I have to wait till the end and beyond to let the accumulated response to the moving images — both of the dancers and the projections — find their mark. In the short term there is certainly a sense of puzzlement and confusion, which are states that arise from the condition of displacement, but it would be too easy to confuse this with a response to the work. Vonmoos has transferred the effects of displacement on to a painterly stage and turned them into symbols and marks on an artist’s canvas, yet the audience does not have the luxury of sitting in front of dance in the same way one can look at a painting (or listen to a recording of music) over time. Without a narrative, to find a place has to rely on constant movement — the essence of displacement, physically and psychologically — to convey meaning. Vonmoos also has the dancers suspend and modify the silicon sheets, tying them up, crumpling them or holding up a corner as if to sweep something underneath. If the projected images are memories, they are constantly vulnerable to disruption. The sheets also take on the roles of temporary bed sheets, shrouds and clothing. There is a dry heat in the atmosphere of the work, where heat is not the kind in which to luxuriate but where you stand still to avoid exhaustion, where you get frustrated, in which you toss and turn at night. In this way Vonmoos imagines dis-ease and its effect on the body. The approach reminds me of Israeli choreographer, Arkadi Zaides, who studied the movements of Israeli settlers attacking Palestinian farmers and their lands seen in images filmed by the Palestinians themselves; against the film footage he takes up these same stances and gestures on stage as a choreographic form to show the effects of cultural aggression on the body. Vonmoos avoids the specific political questions but in abstracting the dis-ease of movement in the face of displacement, she asks the audience to re-translate the affect of the choreographic images to sense their original intent. It is a lot to ask of an audience or perhaps, in our relatively sheltered society, too little. I can’t help noticing (not for the first time) that in the auditorium of one of London’s most prestigious contemporary dance conservatories with high enrolment figures, the audience is sparse. A work of art is only able to speak to those who are willing to experience it and to find a place has plenty to say; if the students who file through Laban don’t engage with the works that are shown there, what does that say about their engagement with the art they are studying or about Laban’s engagement in presenting them?